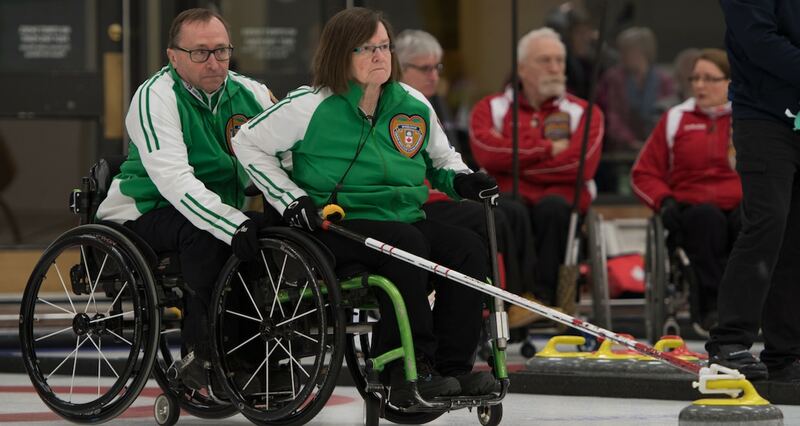 Saskatchewan will try to wrest the gold medal from reigning champion Manitoba when the two face off in the final of the 2018 Canadian Wheelchair Curling Championship tomorrow in Leduc, Alta. 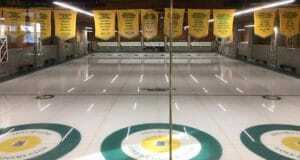 Just a over a month ago the two skips were battling together for a bronze medal at the Paralympics in South Korea, but this week Marie Wright (SK) and Dennis Thiessen and Jamie Anseeuw (MB) have been battling each other for the Canadian wheelchair curling title – a title that Thiessen, the 2017 champion – hopes to repeat. 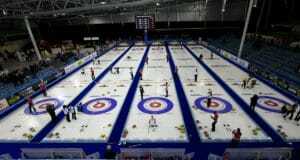 It was a low-scoring semifinal between Saskatchewan – Wright, Gil Dash, Darwin Bender, Larry Schrader, Moose Gibson and coaches Lloyd Thiele and Lorraine Arguin – and Newfoundland and Labrador’s Cecilia Carroll – with Darlene Jackman, Felix Green, Mel Fitzgerald and Leslie Anne Walsh. The teams traded singles through the first half. In the fifth, Wright was forced to draw and slid a bit deep, giving up a steal of one. But she bounced back with a three in the seventh on a measure and stole two more in the eighth for a 6-3 win. 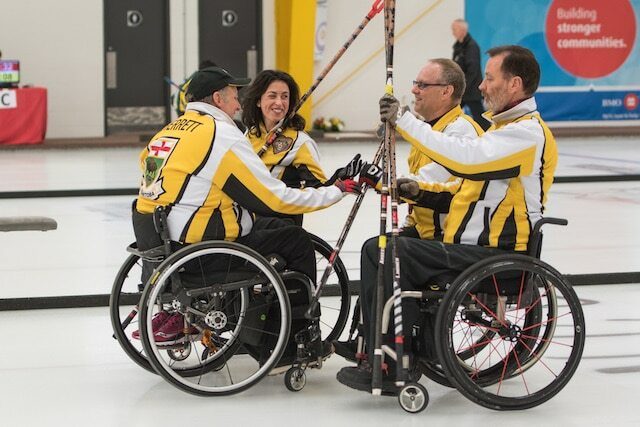 In the other semifinal, Manitoba’s Theissen, Jamie Anseeuw, Mark Wherrett ,Carolyn Lindner and coach Tom Clasper – jumped out to an early lead, stealing the first two ends to take a 4-0 lead into the third. British Columbia scored their deuce in the third, but Manitoba keep the pressure on and forced B.C. skip Darryl Neighbour and his team of Bob McDonald, Gary Cormack, Janice Ing and coach Cody Tanaka to chase for the rest of the game. A steal of four in the fifth paved the way for a 10-3 victory and a spot in the final. The medal games will be played on Sunday at 5:30 p.m. EDT. The game will also be live streamed by www.cbcsports.ca. Find the broadcast schedule here: www.cbcsports.cahttp://www.cbcsports.ca. 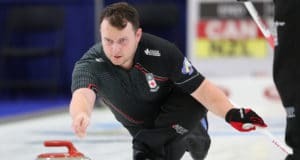 Follow the game scores on the event website, www.curling.ca/2018wheelchair.